Several noted military attacks took place as part of World War II combat on May 13, 1945. However, on that very same day there also occurred a more anonymous incident of devastation that has, until now, slipped historians and the world at large. Author and journalist Mitchell Zuckoff has plucked a diamond of a story out of the remaining rubble of World War II history with his vivid account of the crash of the Gremlin Special. Lost in Shangri-La: A True Story of Survival, Adventure, and the Most Incredible Rescue Mission of World War II draws on remarkable interviews, journal entries, diaries and photographs to recount the astonishing tale of three plane crash survivors and their unlikely jungle rescue. Lost in Shangri-La literally takes off in Dutch New Guinea where two dozen officers, soldiers and Women’s Army Corp members (WAC’s) board the Gremlin Special, a C-47 transport plane. The flight isn’t a tactical military mission, but rather a morale-boosting joy ride into the lush, untouched hidden valley known as Shangri-La. The reader knows what’s coming, but Zuckoff maintains a holding pattern of suspense as he lays out the tropical tangle of mountainous land below. Anticipation builds as the Gremlin’s passengers unwittingly jockey for prime seating and optimal views of the very gorge into which the plane will soon disappear – and disappear it does. Lost in Shangri-La is a wonderfully readable account of the demise of the Gremlin Special, inner-tribal warfare, and World War II military history. Zuckoff doesn’t cease to fascinate as he touches on topics such as the WAC, Filipino forces, tactical rescue and indigenous peoples. Shangri-La doesn’t bog down with overdone detail, but rather offers the opportunity for insight and tender reflection on prophecy and contemporary contradictions long after you close the cover. Mitchell Zuckoff will be bringing his fantastic story, Lost in Shangri-La: A True Story of Survival, Adventure and the Most Incredible Rescue Mission of World War II, to the Grosse Pointe War Memorial this Thursday, October 20, 2011 at 7:30pm. This event is presented by Wayne County Community College District and the Grosse Pointe Public Library. For more information, call 313.343.2075. As a reader I often find myself wondering about little tangential topics, quirks, or details that cushion a story. As my eyes move over one page my thoughts might still be caught a few paragraphs back, roaming around with questions that itch for a little more info. What was that war all about? Does this tiny country really exist? How did the author manage to survive? Charms candy was that little itch for me in Lost in Shangri-La. It seems that Tootsie Roll Industries would have little to do with Mitchell Zuckoff’s Lost in Shangri-La. However, Tootsie Roll Industries is the owner of Charms Candy; the very candy that provided the Gremlin Special’s crash survivors with enough sustenance to survive in the jungle. Due to the hardiness of Charms Candy under a variety of conditions, the candy became a standard part of American soldiers’ military issue around the time of World War II. 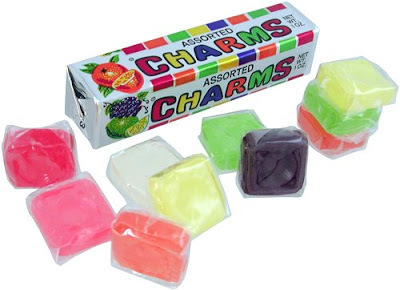 The individually wrapped candy squares, made from sugar and corn syrup, came in an assortment of fruit flavors and were a staple of soldier rations. The treat meant to sustain military forces, however, has taken on a more ominous tone in recent years. The Curse of Charms Candy is of unknown origin, but superstition claims that if a soldier eats, or even keeps the candy in their possession it brings bad luck. You can link over to BookBrowse.com where you will my full review of Mitchell Zuckoff’s Lost in Shangri-La as well as thousands of reviews and intriguing sidebars.